Yesterday I headed up to the Guggenheim. I had planned to go to the Metropolitan Museum of Art, but in the end I felt like something more modern. As it turned out, most of the museum was closed for installing a new exhibit...that was fine with me. Admission was reduced to $8, and I still got to see a wide variety of "name" paintings from the late 19th and early 20th century. On the other hand, the paintings seemed to be the "other" paintings by great artists...nothing too inspiring. I did like one Picasso, though. The most impressive thing about the museum was probably the Frank Lloyd Wright-designed building. Afterwards, I turned on my GPS and discovered I was about a third of a mile from a geocache, which looked to be right on Fifth Avenue. As it turned out, it was a "virtual" cache right in front of the Metropolitan Museum of Art. There was another cache another third of a mile away, so I headed into the park to catch it. If the park was semi-deserted the previous day in the cold, it was almost empty in the cold and rain. Then I took the subway back to Midtown to meet up with Christina after her conference. 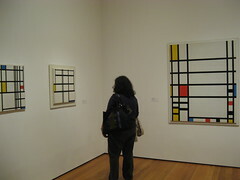 The Museum of Modern Art (MoMA) has free admission after 4pm on Fridays, so we took advantage. I thought the collection of paintings was the most inspiring I've seen on this visit, with fabulous works by Picasso, Van Gogh, Johns and Lichtenstein. I was, however, by the end of the day, essentially done with art museums, at least for this trip. I saw a lot of great paintings, but I'm going to turn my attentions elsewhere this afternoon.